This has been an unexpected adventure fueled by a passion for what we do and resilience when things don't go how we planned. We like to keep track of our milestones to remember each step forward. It's especially helpful for any creator to remember when they have to take those inevitable steps backwards as well. Click on a milestone date to see the event! ​We decide to make a YouTube channel where we could place a single video that we created on enzymes. Due to our fascination with amoebas, the fact that they're easy to draw, and the fact that we are actually sisters- we decide to use amoeba characters and the username "Amoeba Sisters." We upload our first video on the Amoeba Sisters channel. It is created using a cell phone to record the audio (by Pinky) and Microsoft Paint to illustrate pictures (by Petunia). Looking back...it's a bit rough...there is so much we did not know back then. But this is how we started our adventure! We end this first video saying, "Please always stay curious." It will evolve to, "We remind you to stay curious" in a soon to follow video. We go to our first conference together to present to other educators on creating in the classroom. Amoeba Sisters Silver Play Button for 100,000 subscribers. Click above image to see our celebration video! P.S. You can see one of Petunia's cats in the reflection. ​Finding traditional lecture and notes to be a challenge for Pinky in the classroom, we wanted to create something that could be an alternative. Our Unlectured Series is just that---it's an alternative to traditional lecture and notes. It promotes student discussion, student creation, and emphasizes why the content matters in our world. It also utilizes our short videos. You can continue to learn more here. Our art has improved! Petunia has no artistic background, but she has always had a desire to practice, grow, and get better. Check out our old video on homeostasis and compare it to a more recent one on homeostasis to see how we've changed. Our audio is improving. Pinky took some constructive criticism about our audio to improve how we record (and where)! Thanks to our amazing community, our video subtitles have been translated in over 22 languages! We use different tools now. We're always experimenting. We have been inspired by some very passionate educators at a variety of exciting conferences including SXSWedu, CAST, ASM Microbe, and Rice University ComSciCon. We have met fascinating science communicators and science educators online! We can't say enough about master science teacher John Mead's incredible post regarding the transformative power of social media for educators. We now both work full-time on the channel. Pinky will likely return to public edu in some capacity in the future as public education is where her amoeba heart remains. We were invited, along with several other educational YouTube creators, to the YouTube Headquarters in California to discuss edu content on YouTube. Our longest video (41 minutes!) we will likely ever make- this "strolls" through our biology playlist! This project spanned over a year, and we used YouTube's premiere feature to launch it. 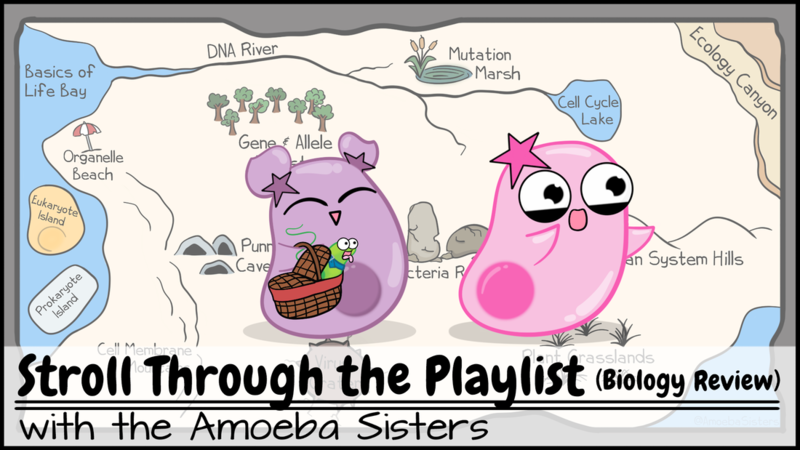 Click above to check out our webtoon which features days in the lives of the Amoeba Sisters. And...we remain a work in progress!